I know about all that and in fact have turned it off and on several times and verified in the system menu that the camera is installed and gone into the other onscreen menu to verify that the camera option box is checked and it is. And today, I stopped at my dealer and had a talk with the service manager about it. He got the keys for a 2009 model (MM but of course no camera) and I attempted to turn on the camera option using the steering wheel buttons, expecting a blank screen except for the check surroundings warning at the top. After repeated attempts we gave up since it would not respond. BUT, that does not mean that on the next try it would not have because we then climbed into my car, I turned it off and attempted to reactivate it to demonstrate the diagnosis screen and it would not respond. When he went back inside I tried once more and sure enough it worked. I have found that it sometimes takes multiple attempts to turn it on after it has been turned off, using the buttons. He suggested bringing the car in so they could run a scan to see if anything is abnormal. Probably at no cost to me. I asked about software versions, thinking mine may be something out of date but he had nothing to offer about that. ok lets try something different... instead try activating the aux video option: (press send, end, and mute) all at once and watch for the words 'diagnosis' to be displayed and for the screen to go up and down. Then go to the 'video' menu on the main screen and select 'aux' under video. lets see if the camera image shows up under aux (you will have to put the car in reverse to turn the camera on if you have it wired to the reverse lead). Also keep in mind that the steering wheel button activation only works because the vim/programming module is plugged in behind the radio. normal cars will not program that way. OK, I did that and the camera screen comes up so now I know the camera and cabling and components all work. But, shifting out of reverse, the screen reverts to blank and the only way to get back to normal is to push for example the radio button which then restores all functions. But, the camera view is not available unless I go back in and activate Aux video again. BTW, the camera view only works when stationary. When I move the car it is replaced by (paraphrasing) "For safety cannot be viewed when moving" which sounds like the old video warning when no VIM is installed. it's clear that all the hardware is OK (maybe) and installed correctly so it's software. But isn't the purpose of the VIM to allow video in motion all the time? If you want to use the VIM function, you must enable it every time you start the car. It's not ON all the time, because if it was then you'd have GPS disabled all the time. When you turn off the car, the next time you start the car you'll have to enable VIM again to watch video in motion. I have no desire to ever watch video in motion but what that little test revealed is that the camera and associated wiring etc. does work and can be displayed. The only question remaining is why the camera does not display when in reverse under normal conditions. Hmmm... I'm just as baffled as you are now. When was your car built? I wonder if there were any COMAND software changes around the time of your car's build. BTW, mine had a build date of 10/2007. Last edited by Rick Hunter; 10-24-2008 at 01:47 AM. Camera looks great, but how does it look on night time? can ou see back well? I don't see an ir or lights so i am curious. Let me know. Thank you. Great job on "centering" the camera. But about wiring. 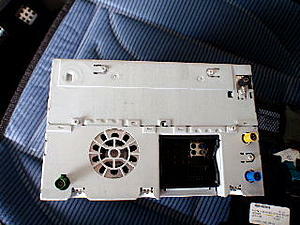 If I remember correctly, Kenwood CCD-2000 has 3 wiring. Ground, reverse light and ACC. So where did you wire the ACC cable? Yupp. I was confused there too. So I put the Reverse light and ACC wire together and the ground I put on its own. 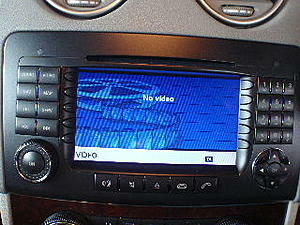 For the Rear Camera, do you have to have the Multimedia Package as the screen? I have the command package. So its the navi but no logic7. Can anyone provide more details (pics would also be a great aid) on passing the cable from the trunk to the head unit?? I have seen several DIY for the camera, all great, but they fall short on this part. Hi, I have this European version APS Command Unit with a video input at the back. I have just purchased a Kenwood CCD-2000 Backup Camera which I believe can be installed directly to the APS. But Unfortunately, the screen showed "No Video" like in the attached picture. Wonder if you can help me? I would like to have this reverse camera installed (I would like to make full use of the existing Fakra video input). And Video in Motion from an external video source. EXACTLY... Need more details on routing the wire for us amatures that do not want to take to many risks with messing up our car! I went through the passanger sideof the car. There is a cable run on that side hidden behind the carpet in the trunk. Push a wire snake (or coat hanger) through it and you should be able to fell it between the rear seat back and the door jamb area. Pull the wire through. I tucked mine under the door sills then under the carpet up the firewall, under the dash and there is a hole behind the command that leads to an area around the glove box (If I remember right). Not to hard just take it slow and use common sense if it won't go through easy don't force it. Vader- Great Job! I have one question you stated you have additional RCA cable to wire camera stuff in back instead of the front. Can you be more specific about how/where you ran the wires/connection? You mentioned over the driver side headliner did you have to run it from the trunk to the front? Cool. Just need to clarify a few things. Did you feed the cable from the handle strip to the inside of the boot through the same hole you fixed the bolt on? There seem to be no other holes to get to the inside of the boot. The nearest alternative looks like drilling a hole through the middle of the plastic catch hook on the right mounting position. Finally, what is the issue about needing an rca extension? Is the one that comes with the camera not long enough to get to the head unit? Last edited by horizon; 07-22-2009 at 11:11 PM. 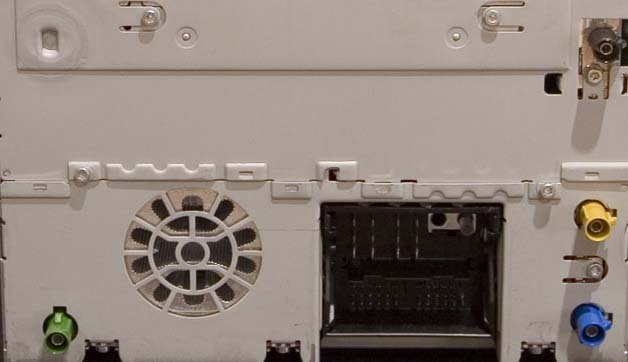 The location and position of mounting/access holes varies with the trim level of the vehicle and production date and location.. For example in the US some of the W204's have a grommit or plastic pop-out where the wires can be routed. Otherwise you can always drill a hole underneath the plastic trim plate. Just be sure to use a rubber or plastic grommit to protect the wiring. There are a couple of wiring options: if you decide to connect the power in the back at the reverse light then you will need an RCA extension to reach the front. Alternately you can connect power up front at the cigarette lighter plug (pop up the shifter trim and unscrew two T-20 to remove) which will allow you to use the length of cable provided with the camera instead. but if you connect power at the cigarette lighter plug, won't the camera be constantly on? Well yes and no. It will have power but it doesn't actually turn on till you put the car in reverse. Thanks very much Rob. Cleared those issues up.